I was walking along today checking out to see if anything good was at the local theatre, and I would have in fact gone to see Up, had my traveling companion not been informed that the movie was a sad work by Pixar, and would make most normal human beings all teary eyed. That said, I have no problems crying in a movie theatre, having worked in one for nearly 3 years, I’ve cried plenty of tears that are unrelated to the movie or sadness, and are generally just from walking in to discover that the couple that had just been in the seat before I came in with my trusty cleaning crew thought it hilarious to use the Nachos they had purchased to redecorate the interior design. That having been said, we did not see Up, but I did see a lot of preview posters that they keep outside, and one amused me quite a great deal. 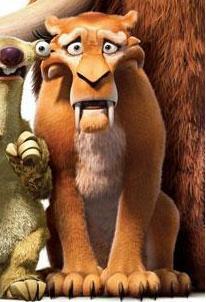 As you can clearly see, Denis Leary is like some kind of Tannish [read white] Druid. This makes perfect sense. 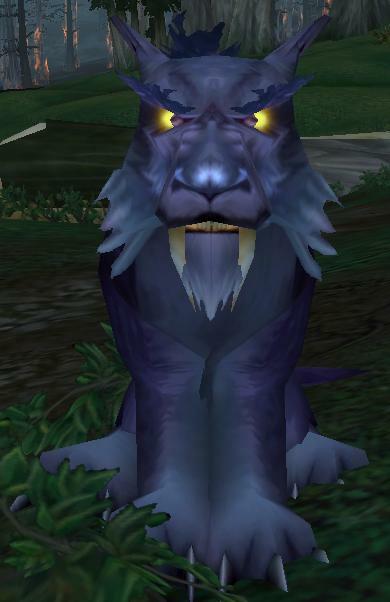 Anyway, point is that minus the long ears and tannish coat, the Blue Sky’s animation for Diego the Saber Tooth Tiger would probably be what a High Res Version of Tauren Cat form would look like, had of course Blizzard not decided to go with an all male Tauren cat form population [sorry Cow Girls]. However, a recent discovery I made while collecting all those netherdrake eggs is that either Cat and Bear form are marked by the system as inherently female [If that were the case, I would assume that when Male Night Elf or Taruen’s transformed they would also see what I was seeing], or that there is a bit of code that actually retains the caster forms gender. This doesn’t mean much but, it does at least point to a notion that perhaps at one point Blizzard was looking to differentiate Bear and Cat Form Genders. The bug any female Druid can stumble across if they run into Netherwing Ledge with the “Matron” title, [on or off, it will still change it]. When you enter the area, because you are under the effects of the Disguise while helping Netherdrakes, it has the unintended [I imagine] side effect of changing your title from Matron to Patron while in caster form. The interesting thing about this is that if you go to cat form while still in Netherwing Ledge, the system will revert the change and turn Patron back into Matron. I just thought it was interesting. As for what I’ll be up to in the future, I’m trying to get together a 25 Man Druid Raid for Naxxramas on my server. I know for a fact that a 10 man druid group can get through the entire instance, and with the exception of Ravenous , I don’t know of any other point in the encounter where it should present trouble to druids [I know that there are some diseases, but rumor is that those can be healed through]. Anyway I’ll be doing more research on the matter to let druids out there know, but I believe that it can be done by chain taunting Ravenous, but I’m not perfectly clear weather the taunt immunity that bosses build up is from a single target or if its just overall taunts. Like I said I’d like to do some research, but I think it could be doable.